The Anchorage Senior Center is one step closer to having a full HF, VHF, UHF, and MESH networking capabilities. 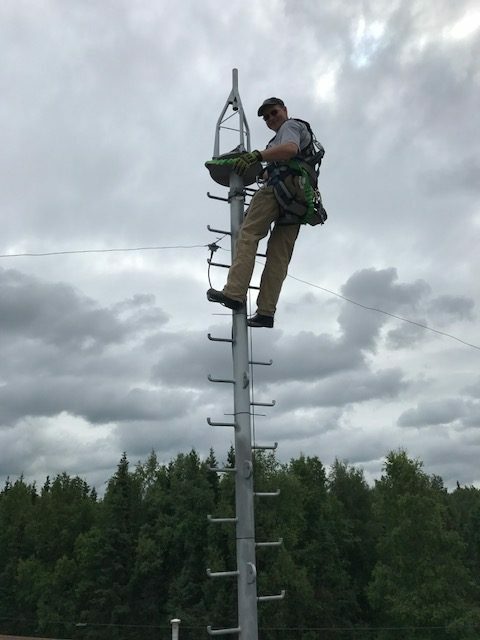 On Saturday, July 30, Sid Atwood (KL7SID), Kent Petty (KL5T), and Riley Petty (13-year-old to be getting her license soon) got together and installed the brand spanking new donated rotator on top of the new tower at the center. The control cable had been prepped a few weeks ago by the same crew. Next step will be to install the new Cushcraft A3S tribander atop this thing. Also to be installed will be two X50 dual band VHF/UHF verticals for voice and data use. Already installed is a 40/80 meter dipole and 3.4 GHz MESH node that is just waiting for another node it can see to join the big network! Thanks to Sid for keeping his poker sharpened to prod this important project along!